I don’t see any problem with Allen’s credentials as a conservative. I think a more valid criticism though is that the GOP needs new blood, not retreads. Allen had 6 relatively undistinguished years in the Senate in which he played along with the establishment GOP that the voters have begun to resent. It would be nice if VA could find its own Rand Paul, but VA politicians are frustratingly milque-toast in their convictions (except for Cooch). This page has been up for months and only has ninety some people. Pathetic. Steve waters and that crazy woman donna holt are behind this because they are pushing bob marshall to run for senate. Steve Waters is a “consultant” who can’t get any real clients so he trolls for anyone stupid enough to pay him. Its pathetic. Interesting that they copied the graphics on the “draft george allen” page that has over 300 members in less than a week. George Allen IS the man to run. He was a great Governor and will win big in a rematch. 90 people in 90 days? Same bunch of losers that helped to get him unelected. 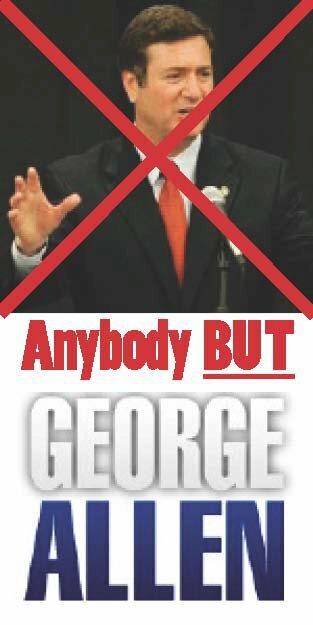 George is the only viable candidate at this time and if the election were tomorrow I would vote for George Allen.